A creamy, fine mousse with expressive aromas of golden apple and almonds. A creamy, fine mousse. Expressive aromas of baked golden apple and almonds. Refreshing lemon curd and subtle marzipan flavors fill the palate. Traditional grape varieties (Pinot Noir & Chardonnay) are hand-picked in the morning at the beginning of harvest season. Only the free run juice is used for this MCC product - aproximately the first 500 litres per ton. Krone Night Nectar is bottle fermented and then matures on the lees in underground cellars after which, prior to dégorging, the bottles are packed in wooden pupitres (turning racks) and the rémuage (turning of bottles) is done entirely by hand. Situated 125 kilometers from Cape Town, Twee Jonge Gezellen, the estate that produces Krone, has been in the family since 1710 and the name has always been synonymous with expressions such as pioneering and ground-breaking. This is especially impressive when you consider that TJ is the oldest family farm in the pioneer district of Tulbagh and the second oldest family-owned wine estate in South Africa. Translated it means ‘Two Young Bachelors’ or ‘Two Young Companions’. 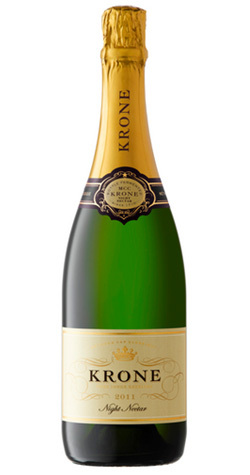 House of Krone was devised as a way of highlighting winemaker Nicky Krone’s work for the estate and to differentiate the Methode Cap Classique wines that are produced there. The wines are benchmark South African sparkling wines and reflect the care and attention that has been put into production at every step.